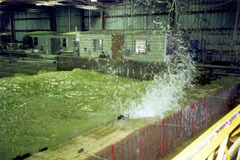 US Army Corps of Engineers Engineering Research and Development Center (ERDC) field testing the Rapid Deployment Flood Wall. Speed – In actual flood incidents RDFW was 38 times faster to construct than corresponding sand bag barriers. Being faster to deploy and requiring less labor translates into increased areas of protection. A wider range of protection results in significant reduction of recovery cost. 2009: RDFW being deployed by volunteer firefighters in Lamoure, ND. Strength – The patented RDFW system uses a combination of light weight internal structure reinforcement and locally available sand. Sand confined to interconnected cells, builds compression, resists water forces and restricts water flow. 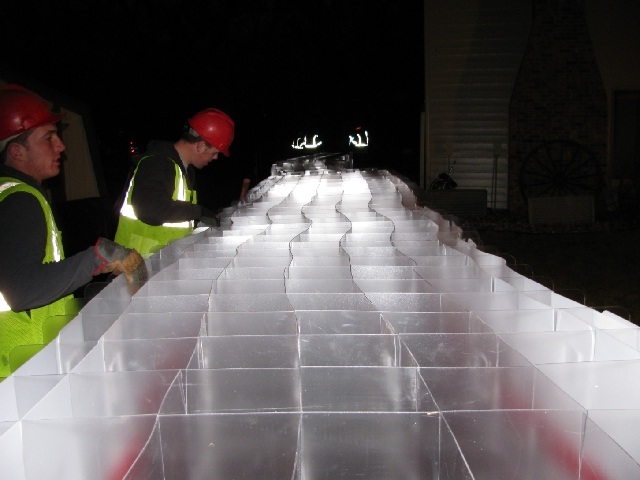 RDFW technology creates a structure that is up to 9 times stronger than current methods of flood protection. In actual incidents, when RDFW has been deployed, there have been no casualties, no injuries and no loss of property. Implementing RDFW technology has enhanced first responders’ capabilities. 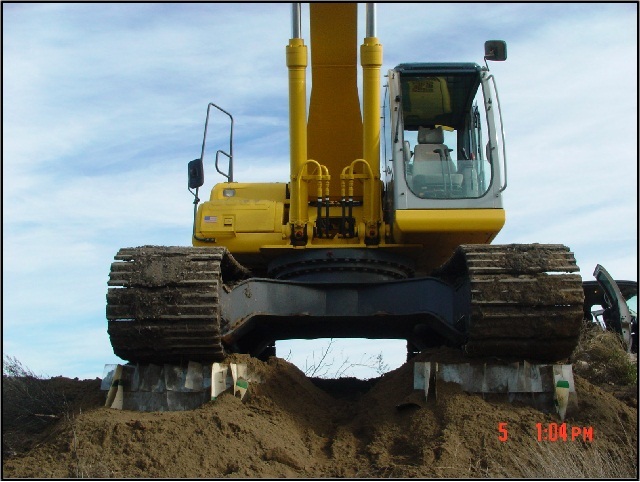 2008: RDFW is strong enough to support a 90-ton excavator in San Joaquin Delta, California during an emergency flood incident. 2009 - Jamestown, ND: A skidloader fills and traverses over RDFW during an emergency flood incident. 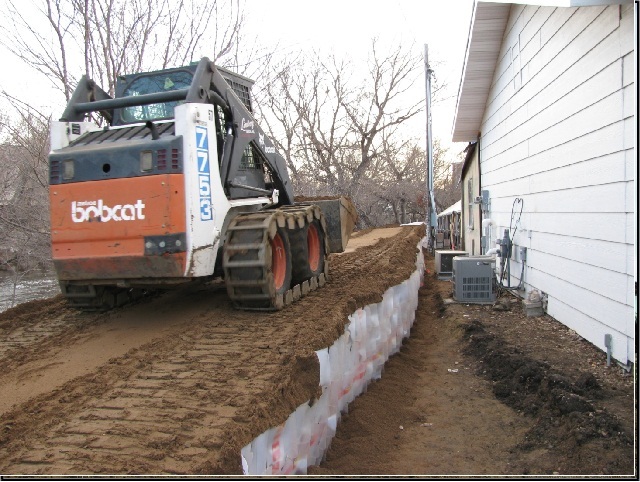 2009 - Jamestown, ND: RDFW is strong enough to work in confined areas in an emergency flood incident. 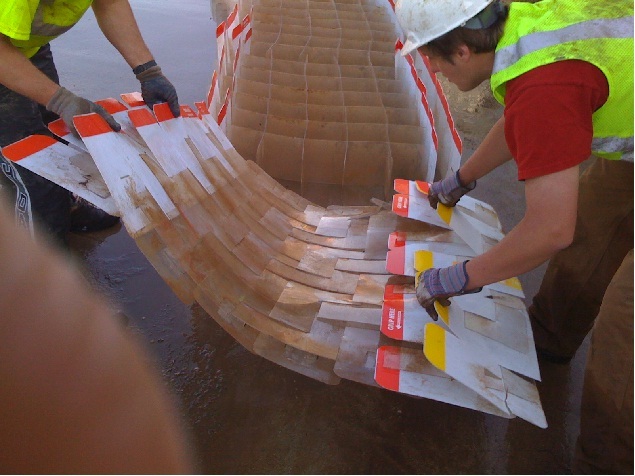 Seepage – RDFW Internal Trusses, combined with confined sand, restrict water flow at a rate of 7 to 1 when compared to traditional sand bags and alternative methods. In actual flood incidents when pumps cannot resist the volume of seepage, the effort is lost. Additional labor required to man pumps adds to the risk and liability of foundation saturation if pumps are not working adequately. 2009 - Jamestown, ND: Compare seepage in alternative method (left) and RDFW structure (right). RDFW installed at night during flood incident in Jamestown, ND, 2009. Night lights illuminate RDFW. Reuse - RDFW removal speeds are equal to deployment speeds. RDFW can be repackaged and re-used. Product pricing is reduced because there is no additional product cost after the first use. RDFW is 100% recyclable. Grappler attachment lifts RDFW. Sand escapes to the bottom. RDFW is disconnected, collapsed, cleaned and repackaged for reuse. Essential components such as speed, structural strength, low seepage rates, and re-use can be compared to legs on a table. Each factor contributes equally to overall performance of a flood barrier. When one component is weak or fails to hold its own, the entire system will fail. RDFW is multi-faceted and designed to be used in various circumstances common in flood fight arenas. Applications include road building over unstable soils, levee seepage and boil control, mudslide diversion and control, and beach erosion. RDFW is scalable and can be configured to fit multiple conditions without delay. Effective protective measures must be adaptable to various tasks and situations that require immediate attention. Ultimately, Geocell Systems’ objective is to pre-deploy RDFW in regional and strategic locations nationwide. Immediate access to adequate supplies of RDFW will enhance preparedness measures. Training programs suitable for emergency responders and untrained work forces can be engaged to demonstrate the simplicity and utility of RDFW capabilities. 100% of the RDFW materials are manufactured and assembled in the United States. We currently have facilities in Missouri and California and suppliers in Illinois and Tennessee. We are prepared to put Americans to work immediately. Increasing efficiency for emergency protective measures will save lives, prevent injury, and significantly reduce flood recovery cost. RDFW is available now for order in any quantity. July 16, 2005RDFW nears completion at US Army Corps of Engineers test site on the Missouri River, Brownville, Nebraska. This structure was filled using a clamshell crane. Finally, a replacement for sandbags! For over 100 years, floods have been fought with two main weaponshuman labor and sandbags. Human labor is finite and expensive. Sandbags are inefficient. And neither takes advantage of the great array of construction equipment readily available in most flood situations. What is needed is a dramatic improvement in floodfighting technology, an improvement that allows you to leverage your limited labor resources with the immense power of earthmoving machinery. What is needed is an improvement that is dramatically superior to the tired, old sandbag. June 2004It took 419.8 man-hours to build this sandbag structure. What are the hidden costs of sandbags? Sandbags may be cheap to purchase, but they are expensive to use. Sandbag walls have inefficient trapezoidal or triangular cross-sections, requiring up to twice as much fill as square walls. Sandbags require enormous amounts of physical labor which, while it is often provided by volunteers, is often paid for after the flood event as part of disaster relief. Sandbag walls are expensive to dispose of, typically being hauled off to landfills at great expense. And in stockpiling sandbags, there is almost always some loss to vermin and mildew. But beyond the hidden monetary costs of sandbags, consider the true cost of relying on sandbags. Sandbags have proven insufficient defense against floods time and again. 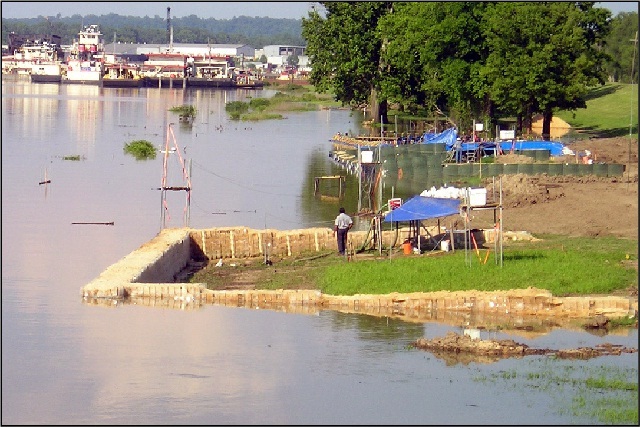 The slow, manual rate at which sandbag walls can be constructed has resulted in billions of dollars in flood damages, year after year after year. But more significant than any amount of dollars is the trauma resulting from flooded homes and the loss of life that occurs annually as the result of flooding. That is the true cost of sandbags. June 2004It took 39.4 man-hours to build this RDFW structure. Anyone familiar with stacking sandbags knows that it is slow, miserable, backbreaking work. "There had to be a better way," decided 20-year veteran floodfighter Al Arellanes. In 1983, Arellanes, in conjunction with the US Army Corps of Engineers, began developing improved and innovative methods for combating floods. 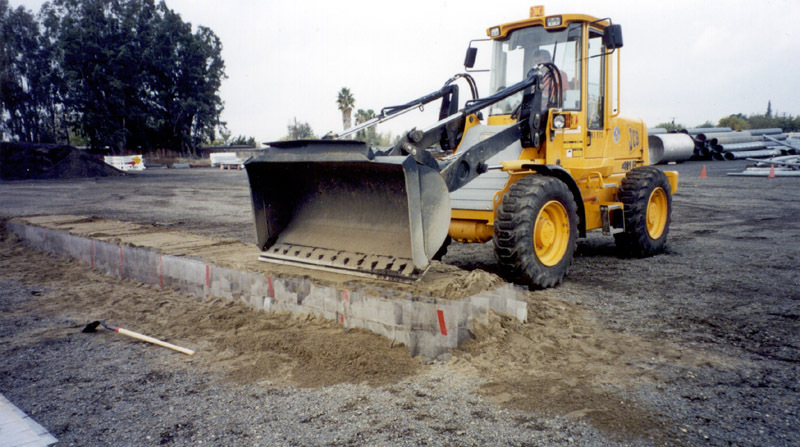 In 1996, as President of Geocell Systems, Arellanes licensed the Army Corps‘ Sand Confinement Grid technology and used it as a basis for developing the Rapid Deployment Flood Wall (RDFW). 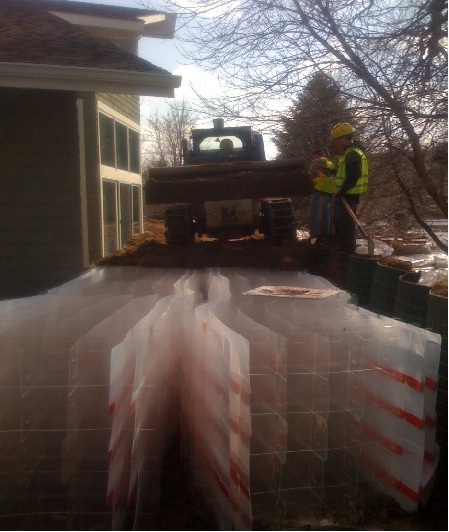 RDFW is a modular, collapsible plastic grid that serves as a direct replacement for sandbag walls. 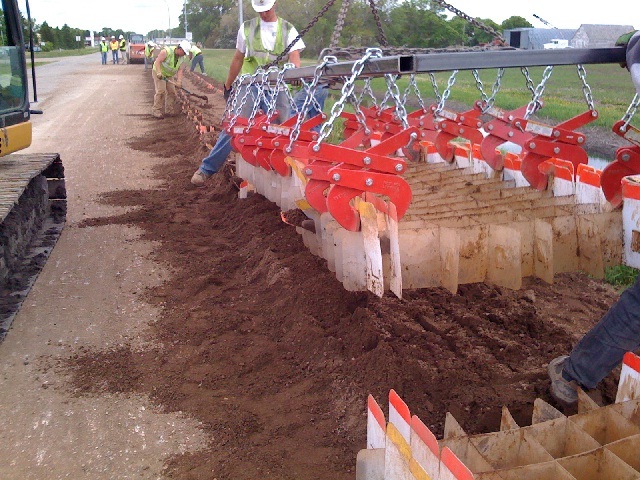 Assembled by as few as two people, an RDFW wall is quickly expanded into place and then filled from the top with a loader, excavator, bottom-dump, or other piece of earthmoving equipment. Drawing on his 20 years of floodfighting experience, Arellanes and the Geocell team designed RDFW specifically to meet the needs and constraints of real-world floodfighting situations. Besides being fast to deploy, RDFW is light enough to be handled by two people, small enough not to be unmanageable in the wind, fits easily into a pickup truck or helicopter, requires no special tools, and is simple enough for anyone to use. 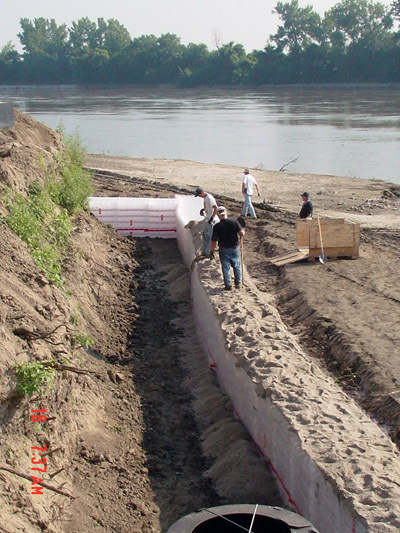 RDFW has a smaller footprint and cross-section than sandbag walls, making it ideal for levee topping or urban use, and RDFW can be filled with a wider range of materials than sandbags. Each container holds 100 RDFW units. Picture taken at Cedar City, Utah emergency flood incident, May 2004. How safe is your stockpile of sandbags? When you really need them, will you open your warehouse to find your burlap mildewed? Will your plastic bags be infested with rats nests? What percentage of bags can you expect to lose? When the water is rising, can you afford to lose any? Why take chances with sandbags? RDFW is made of a tough, flexible, environmentally responsible plastic produced by Eastman Chemical Company and extruded specifically for Geocells RDFW by Spartech Corporation. It is immune to mildew, is resistant to vermin, and can be stored for 10 years or more in any working warehouse. 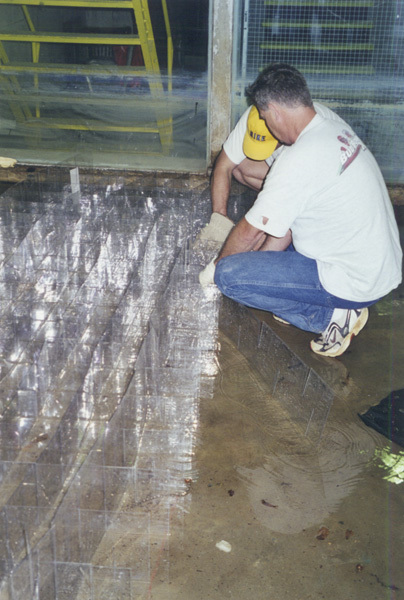 In April of 2000, the U.S. Army Corps of Engineers Engineering Research and Development Center (ERDC) in Vicksburg, Mississippi conducted extensive testing on Geocells RDFW. The results were conclusive and stunning. As noted in the official USACE report, a 50-foot-long, 4-foot-high section of RDFW was subjected to 40 hours of wave action totalling 72,000 waves. Wave height was varied between 0.42 ft and 1.52 ft. The Rapid Deployment Flood Wall proved able to withstand this severe testing with minimal, easily repairable damage. Total sand loss proved to be only eight percent. In addition the testing in 2000, additional testing was conducted by USACE ERDC from 2004 to 2008. The USACE ERDC report was available in October 2008. RDFW was successful in laboratory testing and superior in USACE ERDC-sanctioned field and real-world pilot testing. Please contact us or USACE ERDC for information from this report.